Today, engineers and designers often do not work in a static workplace and have a demand for reliable CAD input devices that meet the special requirements for mobile workstations. Whether they are at the office, at a project site, with a client or in the home office, they need to work independently and efficiently. With the SpaceMouse Wireless Kit 3Dconnexion offers a compact wireless solution for a two-handed workflow that hit those requirements. Navigate and position your 3D models intuitively and select the right views with the SpaceMouse Wireless in your left hand. Precisely and effortlessly, thanks to the patented Six-Degrees-of-Freedom (6DoF) sensor from 3Dconnexion. With the CadMouse Wireless in the right hand, you edit your 3D model using CAD specific features like the dedicated middle mouse button, a smart mouse wheel and the 3Dconnexion QuickZoom. It provides effortless precision due to its optimized 7.200 dpi optical sensor. You can work up to 2 months without charging* and easily connect via Universal Receiver, Bluetooth or USB-cable. How to connect multiple wireless devices to your workstation without blocking all the ports? It is easy with the 3Dconnexion Universal Receiver. The mini-receiver operates at a frequency of 2.4 GHz and needs a single USB port to connect up to 5 wireless 3Dconnexion devices to your computer. Mobile working involves frequent changes of location. While travelling, it is essential to protect your devices. 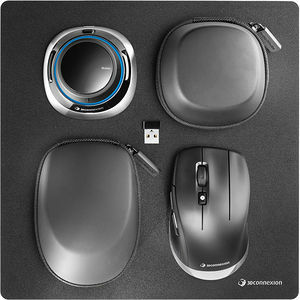 For this reason, 3Dconnexion delivers the CadMouse Wireless and the SpaceMouse Wireless with a compact and lightweight carry case. 3DxWare 10 is the all-in-one driver for all 3Dconnexion devices. Its simple yet powerful user interface allows you to customise and optimise your SpaceMouse Wireless Kit to your work style, for each separate application and environment.